1. What are the advantages of VaproShield Self-Adhered membranes over traditional peel and stick underlays? 2. How do VaproShield mechanically attached Weather Resistive Barrier (WRB) and Air Barrier (AB) membrane systems cost compared to other mechanically attached Air and WRB systems? Our installed system costs (material and installation) are often equal to or less than comparable competitors. It is important to consider all the system components required to perform the specified function i.e. creating a continuous air barrier. The field membrane alone does not account for the complete installed system. 3. What is the VaproShield warranty? We offer a 20 year material warranty. A sample warranty can be found with the installation instructions. 4. How do I fill out a LEED product form for VaproShield products? VaproShield products support efforts toward achieving LEED certification. 5. Where are VaproShield products manufactured? VaproShield products are manufactured in various locations throughout the world, some membranes and accessories are domestically produced. 1. What is a rain screen? A design concept for the building wall enclosure that provides a cavity between the exterior cladding and the main structure of the wall. This cavity allows for free drainage of any water which may penetrate the cladding, an air space to provide rapid drying, as well as a means of ensuring pressure equalization across the cavity to prevent water being drawn into the building itself by hydrostatic pressure or capillary suction. Learn more of the experts at BEE Building Envelope Engineering. 2. How do I avoid potential dams with horizontal cladding attachments? Installing VaproShim SA Self-Adhered under horizontal cladding rails that are detailed tight against sheathing, WRB or AB, allows drainage, avoiding all water damming issues. Learn more about hydrostatic pressure in an article by Joseph W. Lstiburek, Ph. D., P.Eng., Fellow ASHRAE. 3. What is reverse vapor drive? Reverse vapor drive is water vapor moving from the outside through the components of the wall assembly. In order for it to occur, a very specific set of climate and building conditions must coincide. And when they do, it is generally short lived, with a properly designed and sited building. The phenomenon occurs when a high moisture storing cladding, such brick or stucco, coupled with absorptive insulation both get wet during a rain event, which is then followed by a rapid rise in exterior temperatures due to solar radiation which act to drive moisture vapor back into the wall assembly. The amount of inward moisture vapor migration into the wall depends on several factors, including the continuity and quality of the air barrier system, the sufficiency and presence of ventilation in the drainage cavity, as well as material permeance, especially where contact with moisture-laden components is eminent due to design or construction oversight. 1. What is the best practice for flashing different types of windows? VaproLiqui-Flash plus VaproFlashing SA Self-Adhered system is the preferred method for flashing most rough openings and window openings. An alternative of Vapro-SS Flashing is also available. VaproShield offers several options for window flashing. VaproLiqui-Flash plus VaproFlashing SA Self-Adhered are the preferred products for flashing most rough openings which allows maximum drying potential. Popular window systems that work with VaproLiqui-Flash are: nail flange, commercial windows, store front, curtain wall, punched, and recessed. Details can be found here. If your window is not listed please contact us. 2. How do you seal around window perimeters? VaproShield has simple, cost effective details that work regardless of window type. Learn more in our Details Section. 3. Do I need third-party tapes to seal the joints of the field membrane? VaproShield applications do not require any third-party, untested tapes. 4. Why do VaproShield applications not require the use of third-party tapes? VaproShield has designed an integrated tape designed into the mechanically attached WRB / AB membranes at the horizontal lap locations and recommends VaproBond adhesive sealant at vertical seam locations. Untested, third party tapes leave the installer/contractor vulnerable to liability issues. Instead, at VaproShield, our mechanically attached WRB’s and AB’s have a factory installed tape lap joint. The integrated tape ensures the shingled effect and a 6” overlap. The tape can be activated, with simple hand pressure, then roll using a hand roller to insure full adhesion. Where additional sealant is needed, i.e. vertical seams, we offer VaproBond adhesive sealant. 5. Are there any special techniques for cold weather installation with self-adhered membranes? Substrate surface must be dry to the touch with the ambient temperature above 20°F (-6.7°C). See how our adhesive withstood the harsh Minnesota winter. 6. What is correct sequencing for flashing windows and field membrane installation? Review our installation instructions and details for step-by-step instructions. 7. How many fasteners are needed for mechanically attached membranes? It depends, a minimalistic approach is always beneficial if cladding rails are being installed at the same time. Our competitors WRB’s often require numerous amounts of fasteners which create potential for air and water leakage. VaproShield’s membranes can be fastened using a hidden fasten system protecting both the fastener and creating an air tight water tight solution. The use of temporary fastening can also be achieved until the cladding rails are attached, holding the membrane in place. 1. Are there any VOC’s (Volatile Organic Compounds), or other harmful substances in VaproShield membranes? No, there are no VOC or other harmful substances in any VaproShield mechanically attached or self-adhered membranes. 2. Are there any red list chemicals in VaproShield membranes? 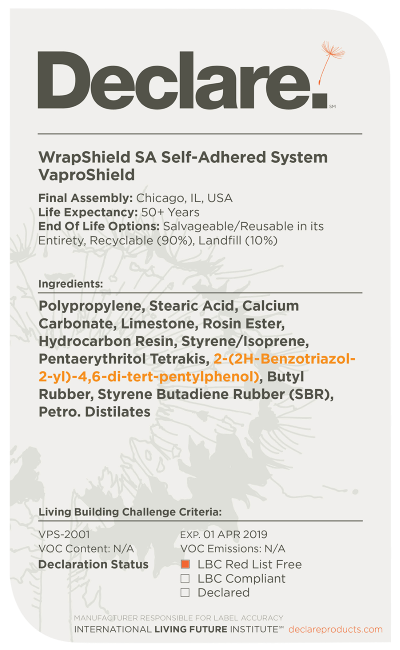 In accordance with the stringent Living Building Challenge regulations, WrapShield IT Integrated Tape, WrapShield SA Self-Adhered, SlopeShield Plus Self-Adhered, and WallShield IT Integrated Tape are free of all Red List chemicals. WrapShield SA membrane is Declare labeled. 3. Can VaproShield products be used with Living Building Challenge? Yes, they are a key component to Living Building Challenge projects, like the Omega Institute for Holistic Studies. VaproShield is honored to participate in the Living Building Challenge, a building certification program renowned for producing the “the greenest [buildings] anywhere.” From its inception, VaproShield has been committed to providing environmentally sensible, affordable, and easy to-install products. 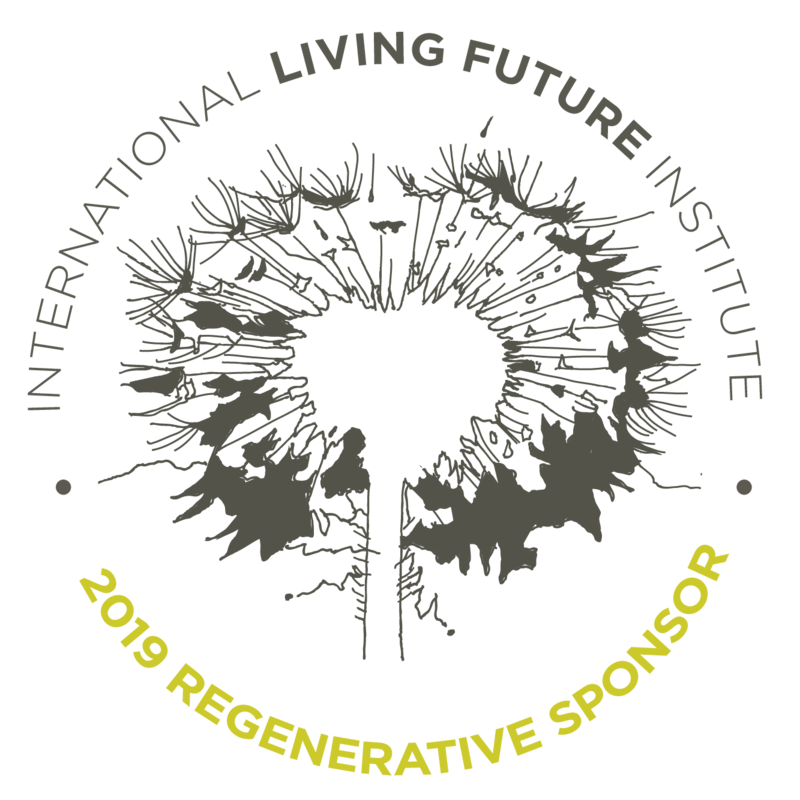 Learn more about the Living Building Challenge Petals. 4. Do VaproShield membranes and related accessories require a HASP (Health and Safety plan)? 1. What substrates are compatible with VaproShield membranes? VaproShield has a solution for all construction substrates, whether new or existing. VaproShield has a solution for all construction substrates, whether new or existing. Our technical team or your local rep can assist you with selecting the best product for your application. Popular compatible substrates include: Gypsum Sheathing, Plywood, Precast Concrete, Concrete Block, Cast-in-Place Concrete, Rigid Insulation, Painted Aluminum, Galvanized Metal, Rigid Vinyl, Steel Studs, Anodized Aluminum, Mill Finish Aluminum, OSB, Framing Lumber, Pre-painted Steel, Semi-rigid Insulation (mineral fiber), Insulated Concrete Forms, Rigid Vinyl. OSB is approved for use with WrapShield IT Integrated Tape and RevealShield IT Integrated Tape. OSB is not approved for use with WrapShield SA Self-Adhered and RevealShield SA Self-Adhered. Contact us if you have questions about compatibility of your substrate materials. Learn more on our Applications page. 2. What cladding systems are compatible with VaproShield membranes? All known rain screen cladding systems. 3. What sealants are compatible with VaproShield membranes? VaproShield recommends VaproBond as an adhesive sealant for contact with our membranes. VaproLiqui-Flash is a troweled on flashing material for rough openings which is compatible with most high quality windows. 4. Do I have to use a rain screen design when installing VaproShield membranes? Industry standard best practice is to provide an unimpeded ventilated vertical drainage plane behind all cladding systems. For projects where a rain screen design is not specified, VaproShield recommends WrapShield RS Rain Screen 3mm and 7mm as well as VaproMat. Learn more about rain screen design from this article. 5. Can I use VaproShield membranes under stucco? Yes, we offer several solutions for both traditional and cement board stucco applications, including WrapShield RS and VaproMat. 6. Are VaproShield Membranes “self-sealing”? VaproShield membranes cinch around most fastener scenarios very well. VaproShield membranes pass the ASTM D 1970 section 7.9 “Capability to Seal Around Nail (Head of Water Test)”. We do not promote the use the marketing term “self-sealing” because it can be misleading. Rather than assume any type of fastener, however well secured, and in any material with any cladding attachment system, will not leak, we prefer to test the actual design using an in-house water testing chamber capable of simulating hurricane forces. This is a service that we offer to help provide solid confidence of long term performance in worst-case environmental conditions. In fact, we typically test fastener penetrations following ASTM E331, but using hurricane conditions for hours rather than minutes with exposed attachments and cladding left uninstalled. Beyond this, the best tests are acts of God, such as when a coastal New York High School stood the test of Superstorm Sandy, prior to cladding. With all fastener penetrations and hat channels in place, and only the VaproShield membrane system protecting the walls, the structure was found to have zero leaks...even after 12 months of exposure. Contact your Local Rep or VaproShield Technical Team to discuss how VaproShield can help your project succeed. 7. Specifications call for a fluid applied air barrier system. What solution does VaproShield offer? Both WrapShield SA Self-Adhered and RevealShield SA Self-Adhered provide an excellent solution for continuous air barrier systems, especially when installed in inclement weather. Fluid applied air barriers systems require dry, no wind conditions for application. VaproShield membranes will not wash off and act as transition membranes, requiring minimal substrate preparation, easily spanning gaps as large as 7/8 inch and acting as its own transition membrane. 8. Do I need a 60mil (1.52 mm) peel and stick at window sills to keep water out? No, VaproShield membrane systems offer enough water hold out capability on their own without the need for a 60mil peel and stick product to be installed. VaproShield recommends vapor permeable VaproLiqui-Flash as a window sill treatment, to supplement the excellent water hold out of our membranes. Since the VaproLiqui-Flash is vapor open it allows any subsurface moisture to dry through the system, extending the life of the window sill. 1. Do VaproShield membranes pass NFPA 285? VaproShield membranes have been included in numerous NFPA 285 assembly tests as well as successfully substituted for other similar WRA/AB membranes within a tested assembly. It is important to understand that NFPA 285 is not a pass/fail material test. It is a full-scale exterior wall assembly test which measures the fire characteristics of all applicable building materials of the design properly assembled together in a two story mockup. This is in contrast to the ASTM E 84 test, which measures surface burning flame spread and smoke developed of a standardized amount of individual material. VaproShield products perform very well in both tests. Both our mechanically attached and self-adhered membranes have participated in numerous NFPA 285 assembly evaluations which have met the requirements for compliance. Additionally, all VaproShield membranes pass ASTM E 84 with the best rating: Class A. Contact VaproShield Technical to discuss how VaproShield membranes can help you comply with NFPA 285 requirements. We recommend this article "NFPA 285: What You Need to Know" by Jesse J. Beitel.